To make a long story short, I quickly developed a web app to take attendance. It worked well and soon after that an opportunity came knocking at my door when a non-profit organization I am a part of, Math for America, expressed that they, too, were seeking an electronic solution for recording nightly attendance for their teacher workshops. I was able to deliver a product for them by adapting my club attendance app. Finally, in 2017, I realized my solution should be expanded to fulfill far more needs. I began developing Sign In Please and I'm proud to announce it will soon be coming to the App Store. The entire app is designed with adaptability in mind. I am sure you will love all of its features. Attendance is too time consuming to be taken by the event organizer. The attendance data should be recorded by individuals who show up and sign in. Ideally, this process should be as simple approaching an iPad, tapping your name and tapping "Sign In". That makes it simple for the user. For the administrator, a lot more needs to happen under the surface. Foremost is the collection of data. What kinds of data are needed from the participants at this event? Phone numbers? Email addresses? The individual needs of data can vary immensely depending on the organization. For me personally, I need an app that can collect student ID numbers. That sole necessity was the reason why I could not use any existing app on the App Store. Sign In Please allows you to require whatever information you could possibly need. Create unlimited groups. For me personally, I have one group for club sign in and one group for checking out laptops. All data is stored on the device: no loss of service due to WiFi and no subscription to cloud services necessary! 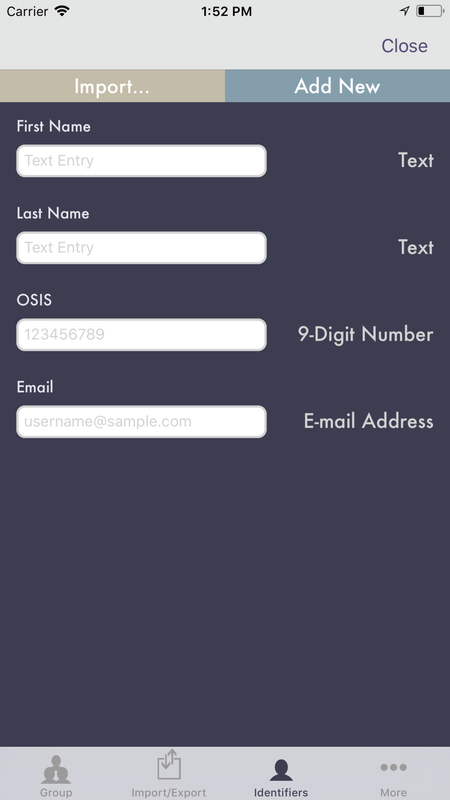 App can provide time totals when users sign in and sign out. Great if you are recording volunteer hours or if you are a teacher using the app to sign out students who take the bathroom pass. View attendance data in-app, organized by day or by participants. Export CSVs or email from within the app. If you collect user email addresses, use the app to send an email to everyone in a given group. Use Time Machine mode to manually edit attendance data in case someone "forgot to sign in." Show your support for a TEACHER who is also a part-time app developer!